“Doc On The Run” sets world record in 5 mile distance. San Francisco Based podiatrist Dr. Christopher Segler set a new world record in the 5 mile distance in Perth, Ontario, Canada…well, kinda! In truth, it was a new world record which will be recorded in the 2016 Guinness Book of World Records. But not to be confused, “Doc On The Run” did not do this alone! And he was not the only one running in a kilt, but he may have been the only one running with bagpipes! The idea to have a kilt run in Perth, Ontario was hatched in 2009 after the Mayor of Perth, Ontario thought the town residents to come up with an idea to help Perth, Scotland celebrate their 800th Anniversary. There were 1,089 finishers in the first kilt run in 2010 which easily broke the old record of 250 setting a new World Record. 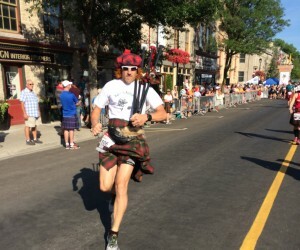 On June 25, 2016 to celebrate the 200th Anniversary of Perth, Ontario, the third and final Guinness record attempt for the largest kilt race in the world: officially called “Perth’s WORLD RECORD KILT RUN”. With close to 5,000 participants, the town of Perth easily set a new OFFICIAL Guinness World Record. © Copyright 2015. Doc on the run. All rights resvered.